Review of: How I Changed My Mind about Evolution: Evangelicals Reflect on Faith and Science, ed. Kathryn Applegate and J. B. Stump (Downers Grove: IVP, 2016). This book features twenty-five autobiographical accounts of evangelical theologians and scientists, in which they explain why they have adopted the theory of evolution. The editors note at the outset that fully “69% of Americans who faithfully attend church weekly believe that God created humans in their present form less than ten thousand years ago” (16). Their goal is to reduce the number of Evangelicals holding this view. Instead of laying out the evidence of Scripture and the findings of scientists, they opt to tell their stories. Deborah Haarsma, president of BioLogos, acknowledges, “Answers won’t be found solely in intellectual arguments, and sometimes piling on more evidence doesn’t help” (11). The book’s editors work for the BioLogos organization and share the book’s copyright with it. For those who don’t know BioLogos, it depends on generous funds from the Templeton Foundation and uses these funds to present “an evolutionary understanding of God’s creation” (16). Each author has his or her unique story. At the same time, one can notice that a number of themes recur in the stories. I will note three major themes. First, the effect of John Walton’s approach to Genesis 1 & 2 has had a dramatic effect in terms of opening the way for Christians to hold to an evolutionary account of the origins of the universe, and even of the origins of life. By appealing to Walton’s arguments, they are able to marginalize the Bible in the origins debate, arguing that the Genesis account only attempts to answer the “who” and “why” of creation, not the “how” and “when” (38, 43). Or, as two other authors put it, the biblical text only addresses the “what” of creation, not “how” God did it (50, 171). Walton’s claim is that Genesis is simply the Hebrew version of an Ancient Near Eastern (ANE) origins account (93, 102, 109, 118) and that such accounts only teach what was the function and purpose of each part of the created world. Genesis thus sets out to refute the views of surrounding nations only by attributing the existing world to the Hebrew God instead of the pagan gods, and presenting the earth as God’s dwelling, his temple. The origins of the material stuff of creation and the means of bringing the world into being were not the concern in such accounts. These claims of Walton have been soundly refuted by Noel Weeks in an article in the Westminster Theological Journal (78:1 , 1–28). Walton incorrectly interprets the ANE texts, brings together texts from extremely diverse times and contexts, and, I might add, presents an exegesis of Genesis 1 & 2 that overlooks all the points averse to his interpretation and makes words like “create” and “make” mean things they simply don’t mean. I’ve listened to Walton deliver his insights in several long speeches and I’ve read one of his books. Unfortunately, J.B. Stump is correct when he writes of himself that Walton’s scholarship “has been a gateway for me (and many others) to consider a more sophisticated treatment of Scripture” (120). It’s interesting that Walton’s interpretation may appear to be more sophisticated for the average Bible reader, but it’s patently incorrect. Secondly, quite a few of the authors refer to Scripture and creation as the “two books,” the books of special and general revelation, respectively (60, 78, 115, 175). Theologians draw from the first; scientists from the second; and both of these “professionals” are supplying us with interpretations of divine revelation. This metaphor for equating the findings of certain scientists with general revelation and calling this “complementary” (18) to the message of Scripture has been around for some time; it may emerge from a misuse of article 2 of our Belgic Confession (190). One author even speaks of “reading the big book of creation alongside the little book of Scripture,” telling scientists that they are “thinking God’s thoughts after him” (95). Another says that the “book of [God’s] works is one that he desires us to take, read, and celebrate” (102). But the Scriptures never speak of general revelation in this way. Rather, the revelation that is available to all people in the world is enough to make them know that there is a God, and that he should be served and praised (Psa 19:1–6; Acts 17:24). This revelation leaves them without excuse when they suppress the knowledge of God and substitute idols in his place (Rom 1:18–20). The discoveries of scientists are not revelations from God, but human interpretations of data that are fitted within particular theories. The Lord never promised a correct interpretation of nature, but he did promise to lead his people in the rich pastures of his Word by the working of his Holy Spirit. Further, since all people because of sin suppress the knowledge of God from creation, Scripture must correct those misconceptions; thus, the clear message of Scripture must have precedence. Our own Dr. N. H. Gootjes wrote some excellent articles about this years ago, called, “What Does God Reveal in the Grand Canyon.” See here and here and here for these articles, plus a final word here. Let us honour our God by keeping his holy Word in its proper place, far above all humanly-devised theories. Finally, the third major theme I picked out was not a theme the authors highlighted, but something I noticed. It really felt to me that the arguments they mentioned against evolution were some of the weakest; they were blowing over straw men. For instance, dinosaurs never existed and Satan buried the bones that testify otherwise (30). Or, “Job invented electricity” (49). These are not the types of arguments used by those who argue for a so-called “young” earth and fiat creation. See this page for examples of arguments that have sometimes been used but are no longer recommended. N. T. Wright’s chapter—an excerpt from one of his books—tries to relativize the entire young earth position by treating it as a tempest in a North American teapot, as if only unsophisticated revolutionaries would ever treat the biblical text in such a fundamentalist way (131–37). Similarly, another author states, “Despite twenty-five centuries of debate, it is fair to say that no human knows what the meaning of Genesis 1 and 2 was precisely intended to be” (73). I would have expected the editors to excise such nonsense. Readers must also endure the expected jab at Bishop James Ussher, who concluded that God created the world in 4004 B.C. (72). In fact, Ussher was one of the most learned men of his time, and sought to determine creation’s date because this was an exercise that many other scholars around him had sought to do. Indeed, many Jews still give today’s date as determined from the moment of creation—today, as I write, it is 17th of Tishre, year 5779 since creation began. See here for a date converter. Finally, all sides in this debate ought to agree that pat responses such as “with God one day is like a thousand years,” will never suffice, and, in fact, represent a misuse of Psa 90:4 and 2 Pet 3:8 (35). The book at hand was not composed to marshal all the arguments in favour of evolution. Rather, it tells the stories of various evangelical theologians, pastors, and scientists. As such, its style is completely in line with the purpose of BioLogos, which aims to “translate scholarship on origins for the evangelical church” (back cover, re the task of Kathryn Applegate at BioLogos). In other words, the book seeks to make evolution seem acceptable by holding up a series of twenty-five models for evangelical believers to follow, and thereby to reduce that statistic of 69% that was mentioned at the outset. However, the book only leaves me more concerned, inasmuch as some of the strongest arguments that seem to have opened the way for these Evangelicals to change their minds about evolution—the three that recur most often in the book—turn out to be very bad arguments. 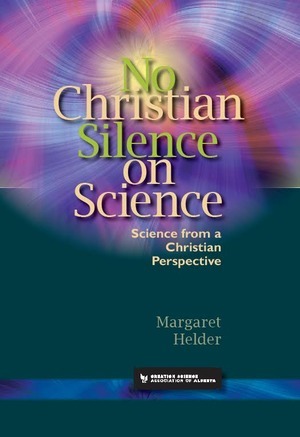 No Christian Silence on Science: Science from a Christian Perspective, Margaret Helder. Edmonton: Creation Science Association of Alberta, 2016. Softcover, 110 pages. Many people have heroes. Also when it comes to science, there are names held in awe: Galileo, Newton, and yes, for some, Darwin. I have a scientific hero too, but she’s not as well-known as the other scientists I just mentioned. For many years, my scientific hero has been Dr. Margaret Helder, a Canadian botanist and prolific writer. I’ve always admired not only her faithfulness to biblical truth, but also her courage and passion for that truth. I’m thankful for what God has done through her efforts. No Christian Silence on Science is a collection of essays illustrating how Christians should think about science. Dr. Helder helps readers recognize that Christians are up against a clash of worldviews. She points out some of the pitfalls that inevitably threaten believers who venture into science. She lays out lessons to be learned from history — for instance, a self-taught naturalist named Philip Henry Gosse. In his opposition to Darwin, Gosse “showed more zeal than common sense” (page 108). Dr. Helder also tackles the question of whether Christians who take the Bible seriously can make any accommodations for biological macro-evolution or geological old-earth positions. This little book is especially going to be helpful for university students taking advanced science courses. There are sections that are quite technical. I don’t have any formal science education beyond high school and an intro physics course in university, so the discussion in chapter 2 about “clustered regularly interspaced short palindromic repeats” (CRISPRS) was a bit beyond my ken. For Christian post-secondary students, chapter 4 is explicitly directed towards equipping them for navigating the academic scientific environment. Not only is there a helpful academic orientation, but also concrete advice. For example, Dr. Helder reminds students that at first glance it may appear that creation-based resources are inadequate for answering the challenges encountered at a secular university. But: “What the student must remember is that there are conservative scholars who support a young earth position, and there are technical documents in this genre as well” (page 85). Seek and ye shall find! However, I don’t want to leave the impression that this book is going to be an impossible read for the non-scientists. There’s plenty here that’s both accessible and fascinating. Take two of the appendices to chapter 2. One is about the echolocation abilities of bats. The other is about a favourite food of some bats: tiger moths. Some species of bat use sound to locate their prey — and this echolocation system is quite sophisticated. In fact, “some echolocating bats can control the width of the ultrasonic beam which they emit” (page 52). The tiger moth, on the other hand, is able to evade bats 93% of the time. One of the ways it does this is through its own generation of high-pitched sounds. These sounds actually jam the bat’s echolocation system. Dr. Helder’s conclusion: “This is clearly a matter of programming in the insect brain as well. This creature is clearly designed. Without the hardware, the software would be irrelevant, and vice-versa” (page 56). If you know a young Christian who’s studying science, this book would be a great gift. After all, the author takes the Bible seriously as God’s Word and our ultimate authority in life. She also has the scientific expertise to demonstrate how Darwinian explanations of origins are inadequate. That one-two punch makes this book highly recommended. Possibilities For Over One Hundredfold More Spiritual Information: The Humble Approach in Theology and Science. Sir John Templeton. Templeton Foundation Press. Philadelphia and London. 2000. Sir John Marks Templeton (1912-2008) is best known as the creator of the Templeton Growth Fund, an investment fund established in 1954, which made him a very wealthy man. Two years before his death in 2008, Templeton, who was born in Tennessee and later became a British citizen, found himself in 129th place on the Sunday Times‘ “Rich List.” But Templeton was not only an investor and a money-maker; he was also well-known as a philanthropist, through the work of his charitable organization, the Templeton Foundation. Established in 1987, the Templeton Foundation offers over seventy million dollars’ worth of research grants each year. The Foundation is currently headed by Templeton’s daughter, Heather Templeton Dill, and it is an important source of funding for a number of individuals and organizations, including the BioLogos Foundation and the Canadian Scientific and Christian Affiliation. One of the Templeton Foundation’s purposes is to advance what Templeton called “Humility-In-Theology” – “helping spiritual information to multiply over 100 fold about every two centuries, especially by encouraging people of all religions to become enthusiastic (rather than resistant) to new additional spiritual information, especially through science research, to supplement the wonderful ancient scriptures” (Templeton, 180). “Humility” was an important word for Sir John Templeton, as can be seen from the title of this book, as well as throughout its pages. Templeton’s philosophy of humility, and the way it shaped his thinking and his philanthropically efforts, is central to his thinking. For example, Templeton writes, “Although we seem to be the most sophisticated species at present on our planet, perhaps we should not think of our place as the end of cosmogenesis.” We must resist the pride that might tempt us to think that we are creation’s final goal, and seek to become “servants of creation or even helpers in divine creativity.” We may be “a new beginning, the first creatures in the history of life on earth to participate consciously in the ongoing creative process” (p. 41). Templeton argues that theologians need to be “humble and open-minded,” and that most of the world’s religions exhibit a “tendency for dogma or hierarchy to stifle progress.” Humility should lead religious leaders to “re-form dogma in a more open-minded and inquiring way as a beginning point for continual improvements” (p. 41). Templeton claims not to want to quarrel with any theologian, and that we must “happily admit” that a particular theologian may be right. “But,” he writes, “let us listen most carefully to any theologian who is humble enough to admit also that he may be wrong – or at least that the door to great insights by others is not closed” (p. 50). The great problem, for Templeton, is egotism, which has led to many mistaken ideas throughout history – including the notions that the stars and the sun revolve around mankind, and that humanity is as old as the universe. “Egotism is still our worst enemy… Only by being humble can we learn more,” Templeton writes (p. 59). So where did this understanding of “humility” lead Sir John Templeton? Sadly, it led him to practically reject the Bible as the completed Word of God, his perfect self-revelation. The Bible, which Templeton includes as simply one of the “ancient scriptures” of all the world’s religions, was written in a different context than today. We now know that the universe is much larger, much older, and far more complex than the ancients believed. And so we are confronted with a challenge: “to enrich understanding and appreciation for the old with a welcoming of concepts and perspectives which may represent truly new insights and creative improvements, which can leverage the power of the past into a forward-looking adventure of learning more and more about the wonders of god and his purposes through ongoing creativity.” Since our understanding of the universe has been “vastly enlarged,” we should no longer be limited in our expression of spiritual truths to “obsolete words, limited concepts, and ancient thought patterns.” The tremendous development in human understanding, Templeton writes, allow us a “fuller and wider interpretation of divine revelation today” (p. 47-48). Ideas have consequences. While Templeton was an elder in a Presbyterian congregation (Presbyterian Church – USA), and even sat on the Board of Princeton Theological Seminary, he did not “limit” himself to the doctrines of orthodox Christianity. His “humble approach” led him to declare, “I have no quarrel with what I learned in the Presbyterian Church. I am still an enthusiastic Christian,” and then to ask, “But why shouldn’t I try to learn more? Why shouldn’t I go to Hindu services? Why shouldn’t I go to Muslim services? If you are not egotistical, you will welcome the opportunity to learn more” (http://www.christianitytoday.com/ct/2008/julyweb-only/128-31.0.html). The sad fact is, however much one claims to be “an enthusiastic Christian,” believing that the teachings of religions that deny Christ can be positively appropriated by a Christian makes one, for all intents and purposes, anything but. And this unfortunate truth is also clearly revealed in Templeton’s book. While Templeton denied being a pantheist (one who believes that the universe is God, and God is the universe), his understanding of the nature of God can only be described as a form of panentheism, which declares that God and the universe are distinct, but that the world is “in” God. Traditional pantheism serves a useful purpose, in Templeton’s mind, but he admits that it is incompatible with the Christian understanding of God. And so he turns to the teaching of the Unity School of Christianity for his conception of God: “God is also me: and I am a little part of him.” As little parts of God, “we may realize the mutual unity of god and his creation. We may conceive that our own divinity may arise from something more profound than merely being ‘god’s children’ or being ‘made in his image'” (p. 86; note that the use of the word “god” as written is in the original). “O LORD, our Lord, how majestic is your name in all the earth! You have set your glory above the heavens… When I look at your heavens, the work of your fingers, the moon and the stars, which you have set in place, what is man, that you are mindful of him, and the son of man that you care for him?” (Ps. 8:1,3, ESV). True humility is expressed in humble submission to the LORD, the Creator, who has revealed himself clearly and completely in his Word – those “ancient Scriptures” which we humans have not outgrown, or surpassed, with all of our scientific understanding. True humility is acknowledging our origins as the direct creation of God, acknowledging the reality of the Fall into sin, and its enduring impact on humanity and all of creation, God’s provision of a Way of salvation, and the fact that we can do nothing in ourselves to merit that salvation. We are created in God’s image. That image has been badly marred by sin. But in Christ, that image is being restored among God’s people. True humility is submitting ourselves to Jesus Christ, who declared that he, and only he, is the Way, the Truth, and the Life. Templeton’s “humility” is, at bottom, and however unwittingly, the height of human arrogance and pride in disguise. In refusing to submit to God’s perfect Word, Templeton set a man on the throne in God’s place. And now, through the work of his Foundation, Templeton’s utopian vision for human society, based in anything but the Word of God, is continuing to be spread. “…Millions of intellectuals the world over have become disenchanted with backward-looking religious institutions… In order to recapture the great thinking minds of the world, the clergy must turn their heads 180 degrees from past to future. With feet planted squarely in the present and eyes directed to the future, leaders can find factual bases in science for viable, solid, dynamic doctrines. For science and rationality are enemies not of religion – only of dogmatism” (Templeton, p. 47). “…At several points in the next few years and decades the traditional theological and religious communities will find the scientific revelations a gold mine, and… by early in the third millennium A.D. a fantastic revitalization and universalization of religion will sweep the world. The ecumenical power will come from a universalized and credible theology and related religious practices, not from the politics of dying institutions seeking strength in pooling their weaknesses. I cannot imagine a more important bonanza for theologians and the future of religion than the information lode revealed by the scientific community… It provides us with a clear connection between human values, including our highest religious values, and the cosmic scheme of things. My prophecy, then, is that God talk… will in the next century increasingly be fostered by the scientific community” (Templeton, 103). “Supporting the publication and dissemination throughout the world of the religious teachings of the Unity School of Christianity… and of closely similar organizations, provided that major support for such organizations shall continue only so long as the Trustees of the Foundation… determine that such organizations adhere to the concepts of (i) usually pioneering in religion and theology with little restrictive creed, (ii) usually teaching that god may be all of reality and man only a tiny part of god and (iii) generally accentuating the positive ideas and attitudes and avoiding the negative” (Templeton, 183). Such were the goals of Sir John Marks Templeton, and such are the goals of his foundation. A serious examination of Templeton’s guiding philosophy, and the philosophy of the Templeton Foundation, in the light of Scriptural principles, should lead us to a sense of genuine concern about any organization that the Foundation chooses to support financially, to question the ultimate motivation behind this support, and the fruits that this foundation is bearing in the numerous organizations that receive its funding. “The Humble Approach” of Sir John Marks Templeton has absolutely nothing in common with the genuinely humble approach of the Lord Jesus Christ. His utopian vision has nothing in common with the eschatological vision of God’s Word. My concluding thought is this: those who receive large amounts of financial support from the Templeton Foundation may do so “with no strings attached,” and perhaps some recipients may be unaware of the totality of the Foundation’s founder’s spiritual vision. But could it be that they are unwitting victims of a larger, and more nefarious, agenda, which has at its base a desire to proclaim a different gospel, by denying the explicit teachings of the Lord Jesus Christ and his exclusive claims? Several months ago, Jon Dykstra reviewed the documentary that was developed in conjunction with the book Evolution’s Achilles’ Heels. I recently had the opportunity to attend a presentation by Richard Fangrad, CEO of Creation Ministries International’s Canadian branch. There was a book table at the event (which is always a draw for me), and this was one of many very worthwhile resources on offer. In his review, Jon gave the documentary a 10/10 rating, and I can only concur that the book is every bit as valuable in its own way as the documentary is. The nine scientists who contributed to this book begin with the following presuppositional framework, in the words of Dr. Wieland: “the straightforward truth of the Bible, in particular the Genesis record, affirmed and taught by the Lord Jesus Christ and authenticated by His rising from the dead.” This starting point, even more than the PhD’s piled up behind the names of the authors of this volume, makes Evolution’s Achilles’ Heels a very worthwhile resource. This is particularly true for Christian students who will certainly have to wrestle with these issues as they prepare to engage in post-secondary science studies, and deal with them on a foundational level, not merely on an issue-by-issue basis. Given the often technical content of the eight chapters in this book, the material is well-presented, neatly laid-out, and accompanied by a number of helpful graphs, charts, and illustrations. Highly recommended without reservation! Blaise Pascal once quipped that he had written a long letter because he hadn’t had time to write a short one. In this booklet it is evident that authors John Byl (who blogs on evolution and creation at Bylogos) and Tom Goss put an enormous amount of time and effort to boil down the key issues of the origin debate. And that isn’t even all of it! Both authors are professors, and one, John Byl, is Canadian Reformed. He has his Ph.D in astronomy, and if this slim book has you ready for more, then you’ll want to take a look at his larger and more comprehensive God and Cosmos: A Christian View of Time, Space, and the Universe. But this smaller book, at just 42 pages, is an ideal size to give to any university student, or anyone looking for an introduction to the origins debate. You won’t find any better! The book concludes with Resource Pages that list two dozen books – these are the very best books on various aspects of the origins debate. So not only is this is an excellent introduction, it also points you to where you can go for much much more. You can pick up a copy – or two or three (these would make such a great give away!) – at Amazon.ca or Amazon.com. This review first appeared on www.ReallyGoodReads.com.